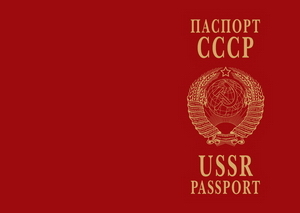 Soviet passport - valid to none of the world's countries! If you had missed the Cold War, now you can make up for it! The original-like 54 page edition where you can even place your own passport photo in. You will find East-German, Czechoslovak, Hungarian, Rumanian, Cuban and many other countries' visa in it. There is a propaganda picture and a famous, communist quotation on every page that tips you off the behavioural rules of perfect citizens of the communist ideal. On the last page reads the most important information in case of foreign residency. The publication is in English and Russian language. The issue can be purchased with the passport's front page but without the texts and drawings. This way it can be used as a 54 page pocketbook.